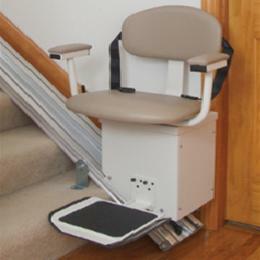 The SL350DC model takes the Harmar Indoor Stair Lift one step further step further with a battery back-up system that provides 15-20 trips even if there is no power. With a cable-operated system that uses steel aircraft cable rated at 4,200 pounds breaking strength, you are guaranteed a smooth and safe ride. Quick too at a speed of 20 feet per minute.